Earlier this month, all I consumed for 98 hours was water. This was a whole new level of Lenten fasting for me. After eating nothing from Sunday to Thursday, I was for once looking forward to a meatless Friday. I had joined a five-day hunger strike organized by the Coalition of Immokalee Workers, a Florida-based farmworker group. 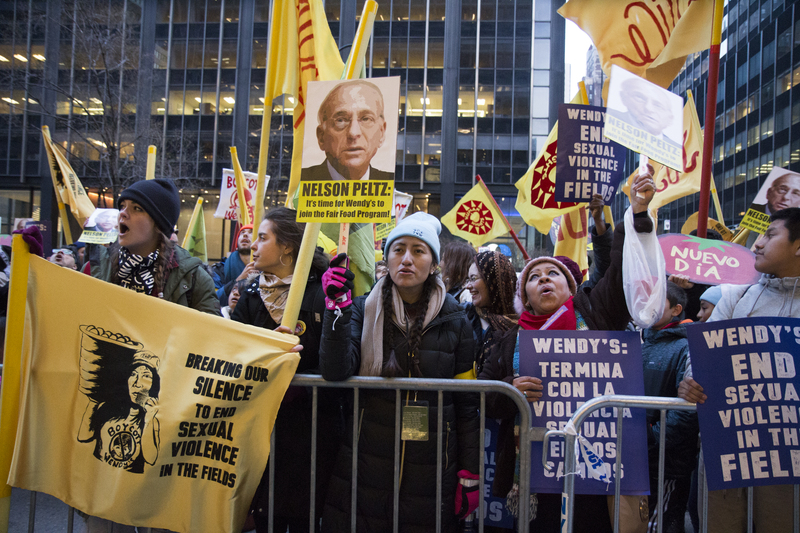 Dubbed the “Freedom Fast,” its goal was to draw attention to the epidemic of sexual assault and harassment of farmworker women and to the C.I.W.’s ongoing boycott of the fast-food chain Wendy’s. Wendy’s is the only major fast-food company not to have signed the Fair Food Agreement with the Coalition of Immokalee Workers. Partners include McDonalds, Walmart and Yum Brands, the parent company for Taco Bell, Kentucky Fried Chicken and Pizza Hut. The legally binding agreement requires companies to only source their tomatoes from suppliers who meet standards like providing shade and clean drinking water for those working long days in the fields under the Florida sun. Under the agreement, work conditions for farmworkers in Florida have greatly improved. All the agreement demands from those who sign is that they pay 1 cent more per pound of tomato. Yet Wendy’s still refuses to sign. For five days, sometimes in the rain, sometimes in the snow, those fasting gathered on the sidewalk of 280 Park Avenue, outside the offices of Train Partners in New York City. For five days, sometimes in the rain, sometimes in the snow, those fasting gathered on the sidewalk of 280 Park Avenue, outside the offices of Train Partners in New York City. Train is the hedge fund owned by Nelson Peltz, the chairman of Wendy’s board and Wendy’s largest shareholder. Twenty of the fasters were farmworkers who had driven up from Immokalee. Dozens more farmworkers had come to support their fasting friends, and most had brought children, too. They were joined by around 30 allies, mostly university students from around the Northeast. Those of us ayunando, or “fasting,” were marked by yellow armbands. For many of the farmworkers, it was their first time in New York. The #MeToo movement has reverberated across the country, calling attention to the long-running open-secret of sexual harassment and assault in the workplace. But while much of the focus has been on politics and the media, agriculture has one of the worst rates of sexual violence of any industry. A lack of legal immigration status keeps some farmworkers in fear of reporting an assault, a reality many predators use to their advantage. In addition, extreme poverty and low wages leave workers dependent on their jobs for day-to-day survival. For a woman being harassed on the job, the choice is between coping with harassment or assault and being unable to feed her children. The C.I.W.’s fair food program creates severe consequences for such harassment. If a farmworker reports being sexually harassed or assaulted, that workplace is deemed no longer to be Fair Food certified. And thanks to the companies that have signed the agreement, losing the certification packs a real economic punch. "The drivers [who would take the farmworkers to the fields], the supervisors, everyone feels free to touch us." There are, however, gaps in C.I.W.’s system. Only big name brands like Wendy’s are vulnerable to consumer pressures and boycotts. Smaller, local suppliers can easily avoid accountability. But overall, the program has been a massive success in improving the day-to-day working conditions of farmworkers. And in the age of #MeToo, the C.I.W. also offers a meaningful way to level the playing field for women who face some of the most unequal power dynamics in the United States. But Wendy’s has not budged. An official spokesperson for the company said in response to the five-day hunger strike: “There’s no new news here, aside from the CIW trying to exploit the positive momentum that has been generated by and for women in the #MeToo and Time’s Up movement to advance their interests.” By Wendy’s logic, the #MeToo movement has nothing to do with women like Ms. Martinez having to choose between being groped and going hungry. But these women are exactly who the #MeToo movement should be about. We began the fast on March 11, the day after the 50th anniversary of Cesar Chavez’s breaking his 25-day fast during the Delano Grape boycott. (I can report that after just over four days of not eating, 25 days seems incomprehensible.) For a week, every growl my stomach made reminded me that I owe every bite I have ever eaten to a farmworker somewhere in the world, whose hands sowed the seeds, raised the plants and harvested the crop. Every morning and every night, volunteer doctors checked up on those of us participating in the fast. I made a mistake loading up on carbs the night before the fast began. I learned this was a bad idea, as it only makes the first two days without food harder. The best inspiration throughout the days of fasting, however, came from the example of the children from Immokalee. When I was busy meeting people, I was distracted from the hunger by the stories I heard and even some of the jokes shared among us. Yet it was the walks home, past the smell of the street vendors carts, that were the hardest, when I was alone and could not rely on anyone but myself to hold me to my commitment. By the third day, the hunger passes. Your mouth begins to taste a bit strange. What I felt more than anything was a kind of constant headache, like I was being punched in the face but very slowly. As I reached the 72-hour mark since my last meal, I began to feel like the worst was over. By the end, I simply felt tired, a little less alert, a little more uncomfortable while standing, all of the symptoms of having a cold but without any of the congestion. The best inspiration throughout the days of fasting, however, came from the example of the children from Immokalee. When your body is beginning to burn its own stored up fat, you get colder easier. Halfway through the fast, we were hit with snow. It was the most miserable I felt throughout the fast. But the misery could not last as I watched the kids run around excitedly, sticking their tongues out to catch the falling flakes. “Don’t laugh, it’s their first time seeing it,” one of the organizers told us. We finally broke fast on the night of March 15 at Dag Hammarskjöld Plaza outside of the United Nations. We marched to Nelson Peltz’s offices on Park Avenue and then back to the plaza. Around 2,000 people turned out, and in front of them we broke our fast, in a communion-like experience. One by one, those with yellow armbands were called up to the stage and given a loaf of bread. After five days, our fast was over, though our boycott will continue. Since our fast has ended, there is no evidence that Wendy’s will buckle. Big questions remain: Can the still emerging #MeToo movement’s success expand its reach beyond the lives of the rich and famous? Can the largely immigrant women who work in agriculture benefit from this cultural and political moment to the same extent as women in media or politics? The example of the Coalition of Immokalee Workers suggests that #MeToo can reach all women in U.S. society but only if racial justice, labor justice and food justice are all taken into account. It feels somewhat contradictory to then go about writing an article about my Lenten fast. But when I think of Jesus in the desert, I think of immigrants in the desert, many of whom may soon end up working in the fields and vineyards and orchards. And when I think of Jesus giving of his body so that others may eat, I think of farmworkers, wherever they come from, whose own bodies make our daily meal possible. I commend this young man for his intense fast, which was not only for the traditional reason of fasting during certain days during Lent, but also fasting on behalf of women who are farmworkers who often endure the indignity of sexual harassment or assault while performing their difficult jobs to harvest food for our nation's people. I must admit that as someone who is middle-aged (56) and has a chronic health problem, I find it difficult to fast during Lent, although I do fairly well abstaining from certain foods. I was saddened to hear that the fast food restaurant Wendy's has refused to sign the Fair Trade Agreement, which legally merely requires such simple fair practices as companies using tomatoes from suppliers who meet certain standards. These include providing shade and clean drinking water for those working long days in the fields in the hot Florida sun. I'm glad that McDonald's has signed the Fair Trade Agreement, as I regularly eat lunch at the restaurant, as well as occasionally shop at Walmart's, which also deserves credit for signing the Agreement. It's absurd that Wendy's refuses such a minimal requirement as paying one cent more per pound of tomatoes . I'm glad that the C.I.W. Is working to raise awareness of sexual harassment and assault among women farm workers, and is attempting to end this undignified and illegal practice. I found it to be inspiring that Mr. De Loera-Brust and his compatriots began their fast one day after the 50th anniversary of Cesar Chavez's ending his incredible 25 day fast during a grape boycott. I read several interesting quotes of Cesar Chavez. The first was, "Until the chance for political participation is there, we who are poor will continue to attack the soft part of the American system--it's economic structure. We will build power through boycotts, strikes, new union--whatever techniques we can develop. These attacks on the status quo will come, not because we hate, but we know America can construct a humane society for all its citizens, and that if it does not, there will be chaos." A vegeterian, Chavez also said, " Only when we have become nonviolent towards all life will we have learned to live well with others. " According to the National Catholic Reporter, (March 2, 2012), Father Joseph McDonnell introduced Cesar Chavez to social justice and the principles of non-violence. The men became close friends in the early 1950's, and. Father McDonnell established a ministry among impoverished Hispanic people in San Jose. Chavez and his wife were among the priest's first parishioners at Our Lady of Guadalupe church. Chavez drove the priest to farm worker camps to say Mass and accompanied him to local prisons. Arturo Rodriguez, Chavez 's successor as president of the United Farm Workers, said, "Caesar Chavez tried to live the Gospels and the social teachings of his Catholic faith every day, but his career dedicated to service to others all began with the lessons he learned early on life from Father McDonnell." The priest, who died at age 8 8, was a strong pro-life advocate, who once spent 30 days in jail for blocking a Planned Parenthood entrance. It doesn't surprise me that this devout Catholic who worked for social justice for farmworkers was apparently inspired by Father McDonnell to also defend the right to life of the defenseless unborn.